Thanks to paultan.org, we can now see clearly how the car will look like. 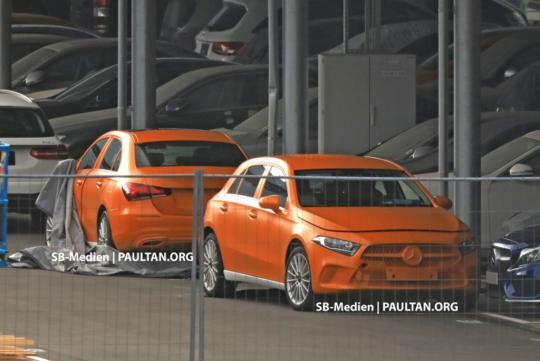 Spotted here in sedan (a.k.a CLA) and hatchback form, the cars here are painted in a shade of orange that are meant for crash testing. Using the revised Modular Front Architecture (MFA) chassis, the new car looks slightly larger than before and will have an interior that will mimic a smaller E-Class. Large screens for the instrument display and infotainment will be likely to feature. Engines wise, the car compact executive will likely make use of a new range of four-cylinder petrol engines. It remains to be seen whether the new engines will be paired with a new torque converter automatic gearbox or the dual-clutch transmission used currently. Backside looks like Audi leh. Or Hyundai.. or Kia. 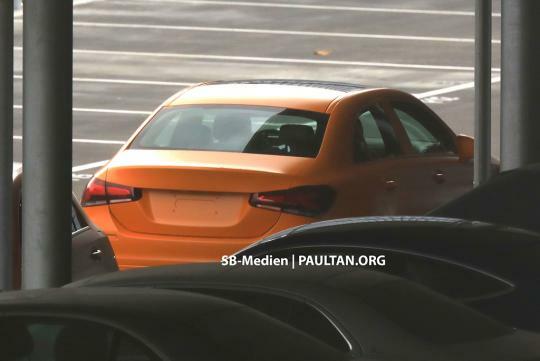 The rear bears an uncanny resemblance to the Audi A3 and Kia K3. The front looks like another copy and paste job. The Designers are either getting lazy or lack creativity. The existing C, E and S class all look alike. Very disappointing for an established brand that claims to be "engineered to move the human spirit" !! !